Sea Horses is a poetic diary recounting Karen Mulhallen’s time on a remote island at the edge of the great abyss in the high Atlantic. Sable Island, Nova Scotia is home to a band of wild horses and 40,000 seals and an enormous and richly diversified world of plants and invertebrates. if that is your only language. if bodily form deceive not the eye. Seal wants to be here forever. overlooking the gentle waves of the north beach. overlooking the rough breakers of the south. Horse is lanky, angular; seal is small, smooth. Horse moves all his joints as he trots. Seal is quick, moves like the grains of sand. Horse’s coat shimmers silver, so does seal’s. 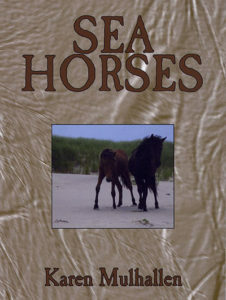 : seals, birds, beetles, horse.